Raipur residents talk about the lakes in their city as if they are a family. Some lakes are mamas and bhanjas (maternal uncles and nephews), others are sisters, and a few are even married to each other. The city’s love for human-made lakes started a thousand years ago, when the rulers of Chhattisgarh started constructing water bodies to ensure steady water supply throughout the year. The oldest lake, Budha Talab, was constructed in the 10th century by Raja Brahma Dev and the most recent one, Telibanda, in 1935. Rulers continued the trend through the years because they realised this was the only way to conserve rainwater in the area that has non-porous soil. At its peak, Raipur had around 200 lakes. Today’s Raipur is a far cry from its past, with just 40 lakes remaining, many of which are nearing extinction. Official data shows the city has lost more than 100 lakes in the past 25 years or four lakes a year. The reason: unplanned and rapid urbanisation, clubbed with government apathy. “The undulating landscape of the city, which at one point of time was supporting these lakes, has been encroached upon by buildings, leaving no space for water to move. The encroachment on lakes leads to floods during the monsoon,” says Ninad Bodhankar, a professor with the department of geology in Raipur University. In response, the Assembly passed a resolution in 2013, saying that ponds and water bodies are the state’s cultural heritage. But it did nothing to conserve the lakes. Instead, the state, which recently shifted the capital to the outskirts in Naya Raipur, recognises only three lakes that emulate the age-old water harvesting system. “The Assembly made the resolution and it stopped there,” says former Cabinet minister Ram Chandra Singh Deo, who authored a book titled Harbadi Main Sabhyata (Civilization in a Hurry). It was Deo who predicted last year’s devastating floods in Srinagar in his book, saying that as human encroachments over the Dal Lake and other water bodies continue, there will be a day when a deluge would wreak havoc. He points out that in terms of number of water bodies, Raipur is no different from Srinagar. And he warns that a similar fate is awaiting the city. But Raipur Municipal Corporation (RMC), which is responsible for the upkeep of lakes, has found an easy way to wash its hands off the task—by claiming that the dirty ones are “privately owned”. For the irrigation department the lakes are “too small” to administer. “They are owned privately. The land around the lakes has been sold, bought, resold and bought again over the years. But the ownership has not been updated in the revenue records,” says a senior corporation official. Let alone conserving the lakes, the authorities are, in fact, destroying them. Take the case of Telibanda Lake, which was recently turned into a tourist attraction. In July, RMC first turned one of its banks into a lakefront—displacing about 300 families of the fishing community—to build parks and restaurants around it. It is now covered with concrete paths, while on the other side of the lake, real estate has come up in a big way. A Raipur journalist, Zia Khan, explains how polluted the water body has become. “There was a drop in the fish catch from this lake even before the buildings came up due to pollution and sewage,” he says. A study conducted earlier this year by Sustainable Sanitation and Water Management (SSWM), an initiative supported by a German-government-owned enterprise Gesellschaftfür Internationale Zusammenarbeit (GIZ), bolsters Khan’s claim. It shows alarming statistics on the extent of pollution in the water bodies and directly links pollution in the lake with lack of sanitation. “Only eight per cent of the city’s population has the option of door-to-door collection of solid waste and seven per cent of the population dumps waste in the open, which goes to uncovered drains running through the city during the rainy season,” says Varun Shende of Pune-based non-profit Ecosan Services Foundation, which conducted the study for SSWM. 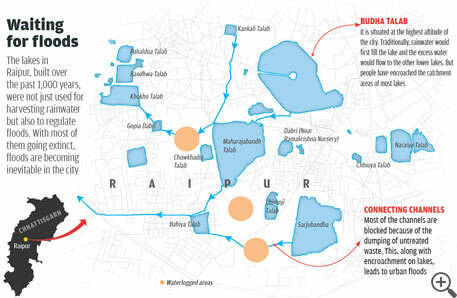 The study shows that Raipur lacks scientific landfills and there is an imminent threat of water contamination through leachate produced from the untreated solid waste. Bodhankar says four main industries—oil extraction units, ferroalloy manufacturing units, agro-based industries manufacturing fertilisers and pesticides, and textile units—have contributed to pollution and eventual shrinkage of the lakes. Construction of residential and commercial buildings around water bodies has decreased the soil cover, leading to decreased percolation and increased surface runoff which causes floods. “Increased used of inorganic fertilisers across the landscape, especially rural areas surrounding Raipur, has led to eutrophication of surface water,” he says. 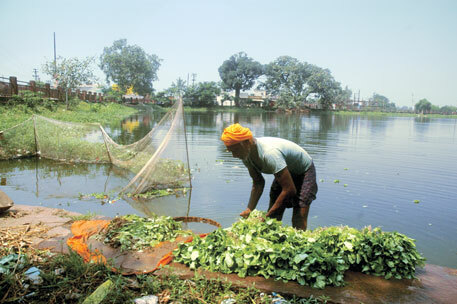 On the other hand, encroachment of wetlands, which form a catchment for many of these lakes, has become a major source of carbon dioxide emissions due to oxidation of large stocks of organic matter. Methane is generated from anaerobic decomposition of wetlands, and its impact on climate change is over 20 times greater than that of carbon dioxide over a 100-year period, as estimated by US Environmental Protection Agency. According to the Chhattisgarh government’s study “Biodiversity and ecosystem analysis with reference to traditional water harvesting systems”, the lakes have also acquired religious significance over a period of time, with temples constructed on the banks and idols immersed in the water. With the growth of residential areas around the temples, the catchment area is highly stressed as older passages for surface flow stand altered. The study revealed that all lakes, spread over 69.239 hectares, are polluted and heavily silted. Water samples analysed by Shende and his team show abnormal levels of E coli contamination along with presence of nitrates in higher concentration in drinking water. In fact, in 2013, 627 cases of waterborne diseases in the city were a result of poor sanitation and unhygienic conditions. Shende’s findings are corroborated by Bodhankar who connects the waterborne diseases to blocking of drains and subsequent flooding during monsoons. “People blame the water bodies for flooding but indiscriminate dumping of garbage is what blocks their neighbourhood drains. Wherever there are gaps in the water distribution network, the contaminated water gets mixed with drinking water, causing diseases,” Bodhankar says. Abid Ali Khan, who conducted a case study for Royal Haskoning DHV, a premier engineering and consultancy organisation of the Netherlands, in association with GIZ, on improvement of storm water management in Raipur, warns that low-lying areas of the city will get flooded if rainfall exceeds 100 mm in a day. As most experts, including Bodhankar, Shende and Khan, say the drainage system is directly linked to water bodies, the municipal corporation has to intervene. While RMC needs to recognise the importance of these water bodies, Khan says, drainage has to improve. “The sewage system needs improvement and the catchment area of all lakes should be demarcated so that waste water can be locally treated and diverted to the lakes. Open dumping of waste has to stop,” he adds. But as with other municipalities, RMC too faces acute staff shortage and the tenures of senior officials, who can perhaps oversee projects to improve sanitation, are too short for long-term work. In such a scenario, the Chhattisgarh government and its elected members have to do more than just say that ponds and lakes are cultural heritage. Rulers OF Chhattisgarh since the 10th century understood the topography and soil characteristics of the area and took advantage of that to make water bodies across the city. The top soil in most of the state has shale and sandstone. It is impermeable and helps in water retention. This also means groundwater is scarce. So the rulers, early on, started devising ways to tap surface runoff keeping in mind the scarce groundwater. The first lakes were built on land that remained waterlogged for more than three months. The rulers also wanted to connect the lakes so that every drop of rainwater is conserved. Because of these connections, some lakes were considered married to each, some were called siblings and others were uncle-nephew lakes. Over a period of 500 years or so, planners of the city made water bodies in elevated areas in the direction of descending elevation. Once rainwater or surface water would fill the structure at the highest elevation, it would overflow or spill into the successive structure, leading to conservation of every drop flowing towards the stream or river.